Following on from a fully-booked London 2018 course, we are delighted to welcome registrations for our London 2019 event. This is our flagship training programme of the year and is highly anticipated. Please note that we are now down to our last remaining places and registration is closing very soon! Get ready to join participants from all over the globe for six days of live Style Coach™ training during this once-yearly VIP event. Benefit from one-to-one support from our master trainer, Bernie Delaney, and meet the founders of the institute, Tracey Beaumont & Kate Redmond. Our group training in London is engaging, interactive, inspiring, and will put you firmly on the fast-track to your career as an Accredited Style Coach™! What’s special about our London course? Our ‘VIP Fast-Track’ diploma course is the most time-efficient, and closely-guided training course offered by the Style Coaching Institute®. We limit the classes to a small and exclusive group of delegates, to ensure that every participant receives the highest standard of mentoring possible. We get to know each individual and personally support them through every stage of their Style Coaching™ journey. We also create a private WhatsApp group for each class, so everyone can stay in touch, share links, ask questions, and offer encouragement and support before, during and after your Style Coach™ training! The London Style Coach™ diploma course offers you a unique opportunity to meet and network with an intimate group of aspiring personal stylists, image consultants and Style Coaches™, and you benefit from the personal support and guidance of our master trainer, Bernie Delaney. Bernie has an incredible vault of practical experience to share, and her passion for Style Coaching™ is contagious! Who is the London course for? The London course is ideal for anyone who really values face-to-face interaction and hands-on learning. Our VIP groups form very close bonds and long-lasting friendships – even business partnerships! During the online ‘Key Stage One’, we bring everyone together in a private WhatsApp group so that we can get to know each other before meeting in London – this helps to take away any nerves and creates a lot of excitement and positive energy in advance of the first day of training! You’ll also have close support and guidance from our directors, Kate and Tracey, with personal Meet & Greets in London and direct instant messaging whenever you have a question to ask them. What can you expect from the training days? During your six days of live training in London, your learning will be colourfully brought to life by a wonderful variety of visual demonstrations. You will also be able to practice your new skills in a friendly, light-hearted and encouraging environment. Try out body shape and colour analysis, identify ‘Style Personalities’, familiarise yourself with the tools you can use with your clients, and practice various coaching skills with like-minded people who are equally keen to learn and grow! The course is fun, engaging and interactive with plenty of opportunities for you to be hands-on with your learning. We include a refreshing mixture of ad-lib lectures and interactive discussions, beautiful and inspiring Keynotes, practical demonstrations using a multitude of clothes and accessories, partnered role-plays, colour analysis, makeup application, and much more! And of course, if you like to have structure and closely-guided learning, then this is the course for you! With a specific schedule, you’ll know exactly what you need to do and when. Once you’ve made that commitment to becoming a Style Coach™, you know that you are on the ‘fast-track’ towards your new career. Our VIP participants also receive an exclusive ‘Certificate of Completion’ (in addition to their ‘Style Coach™ Diploma Certificate’) that acknowledges the further study and practical training they have completed in London. Approximately 7 hours of online study via our beautiful eLearning Platform. Get a head-start on your studies by beginning your course as soon as you’re ready. You can even start today! 6 days of live tutored training at London Stansted. The course is hosted over 6 full days in London Stansted, starting on Monday 29th April 2019 and concluding on Saturday 4th May 2019. Stay in close contact with our team, and complete your studies from home. You can submit your diploma exam online via our eLearning Platform. No restrictive time limits for completion. When you become a Style Coach™ you learn how to be an image consultant as well as a Life Coach, plus you learn Personal Branding, Image Management, Personal Grooming, Personal Shopping, Color Consultancy, Wardrobe Styling, and even Self-Image Psychology. Our course contents are totally unique and unlike anything offered by other image consultant trainers! Please note that the exact schedule of topics that will be covered during the live training days in London can vary. The most important ‘visual’ / ‘practical’ lessons are covered during the live classes, while topics that are easy to study by yourself are allocated to the online stages at the beginning and end of the program. When you arrive in London, you’ll receive a beautiful set of published training books to keep. You’ll also have access to our eLearning Platform where you can view your course modules online – anytime, anywhere, using your preferred device. The printed training books are ideal if you prefer studying offline, with the option of writing notes and highlighting key points. The live tutored training days are hosted over 6 full days in London Stansted, starting on Monday 29th April 2019 and concluding on Saturday 4th May 2019. The London 2019 Style Coach™ Diploma Course will require a total investment of £3290 GBP. With every enrolment, a deposit of £595 is payable to register and reserve your place. This can be paid securely by PayPal (using your credit or debit card) or via bank transfer (just drop us an email for the details). Your full remaining balance will be due for payment 8 weeks in advance of attending ‘KEY STAGE TWO’ (on or before 4th March 2019). However, it is useful to bear in mind that once your payment has been made, you can start studying online immediately. For some students, this enables them to get a ‘head start’ and complete the course earlier than expected. If you wish to book accommodation at the Radisson Blu Hotel, this can be added to your cart at the time of your enrolment. When booked through the Style Coaching Institute® we are able to pass on a favourable bed & breakfast rate for either single occupancy (approximately £95 per night) or double occupancy (approximately £115 per night). We offer the option of booking 5-7 nights. * Please note there is only ONE COURSE EACH YEAR IN LONDON, so the places are subject to very limited availability. Once a course is fully booked, registration closes abruptly and we then operate a waiting list for availability in the following year. If you would like to join us for London 2019 then we recommend submitting your registration and deposit as soon as possible. Our London ‘VIP Fast-Track’ course is conveniently hosted at the Radisson Blu Hotel at London Stansted Airport. 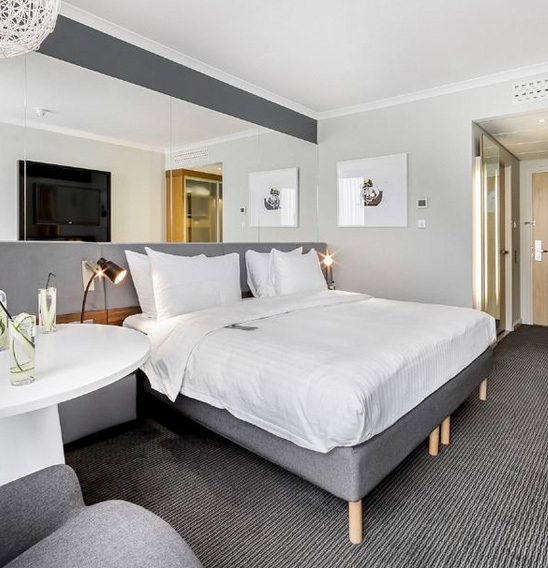 At the time of your online enrolment, you can easily add on accommodation to suit your needs (reduced rate bed and breakfast at the Radisson Blu Hotel). We include all your daytime meals and refreshments, so if you are joining us from abroad then travel and accommodation couldn’t be more convenient. Once you arrive, you can relax and study in style! 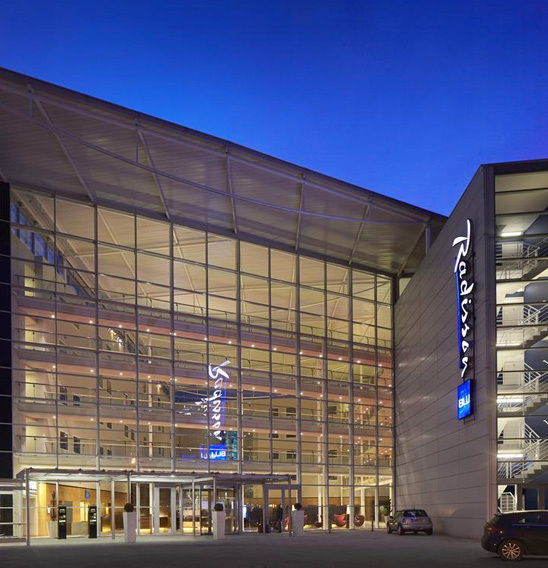 The Radisson Blu is an ultra modern, contemporary styled hotel located at the heart of one of the UK’s busiest airports. It is conveniently linked by a covered walkway directly to the main airport terminal. London Stansted Airport is accessible by car via M11 (Junction 8) and M25 (Junction 27) and the hotel has a large on-site car park. The airport railway station and coach terminal also provide direct links to central London and the surrounding counties. London Liverpool Street station is only 45 minutes away via the Stansted Express. * Please note there is only ONE COURSE EACH YEAR IN LONDON, so the places are subject to very limited availability. Once a course is fully booked, registration closes abruptly and we then operate a waiting list for availability in the following year. If you would like to join us for London 2019 then we recommend submitting your registration and deposit as soon as possible. We are now down to our final remaining places!